Students in the junior high Spanish class get a taste of the centuries-old Mexican holiday. WINSLOW — In Claritza Hurdle’s class at Winslow Junior High School, the students do more than just learn and speak Spanish. They study the customs of Spanish-speaking people, cook Spanish food and learn about Spanish traditions. They even learn to dance the tango and salsa and perform them at a talent show at the end of the school year. 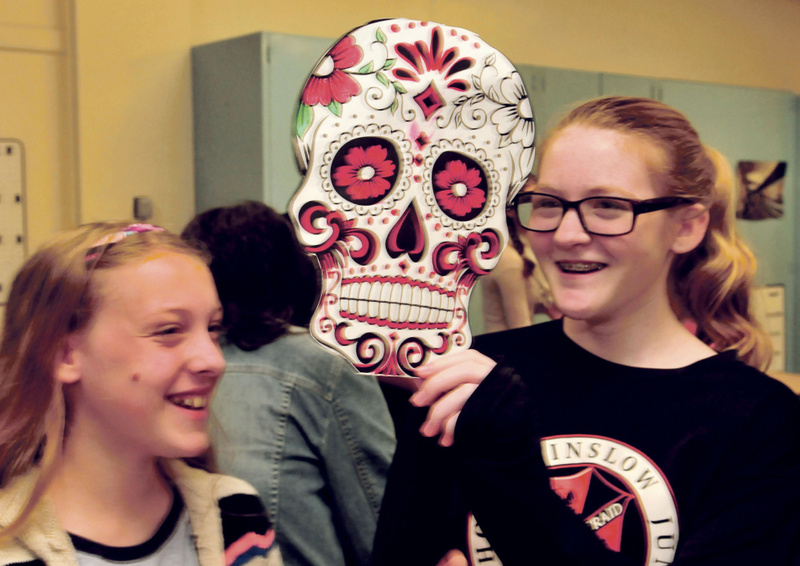 On Monday, the Day of the Dead, or Dia de los Muertos, the eighth-grade students celebrated those who have died. The students started preparing for the Mexican holiday last week by decorating a corner of the room with an altar on which they placed flowers, candles and colored masks. 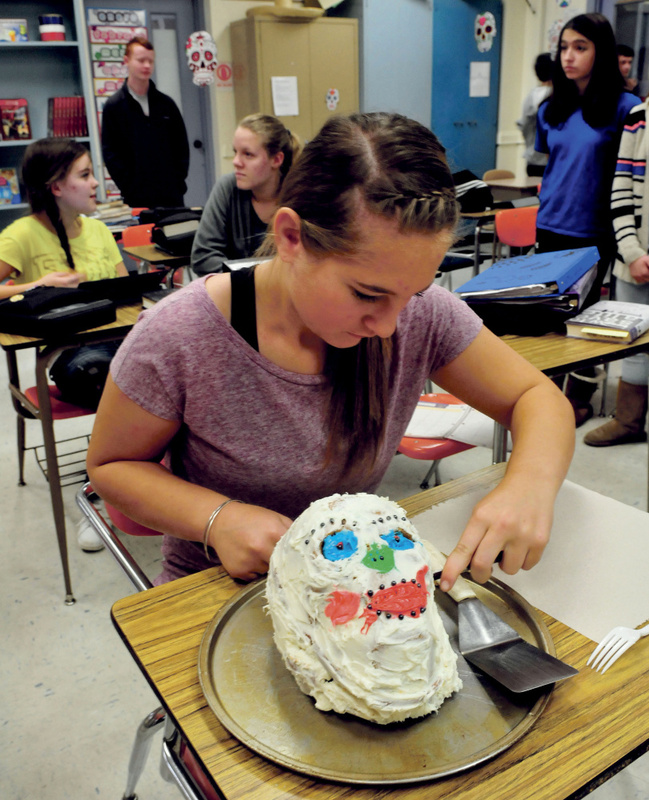 The students also dressed a mannequin and skeleton in special garb and baked a confetti cake in the shape of a skull, slathered it with white frosting and made blue eyes, a pinkish mouth and green nose. Hurdle, who teaches Spanish to seventh and eighth-graders, said many people think the Day of the Dead, which falls on Nov. 2, is Halloween, but it is not. “It’s more to show people respect, to remember loved ones,” said Hurdle, who is originally from the Dominican Republic and grew up in Ohio. The Day of the Dead, which started in Mexico, has been celebrated some 3,000 years. In Mexico and other Latin countries and places with a Latin influence, like California, the day is celebrated with great parades and people parading in costume, according to Hurdle. It is also different from All Saints Day, Nov. 1, which is observed by Roman Catholics and some Protestant denominations and is dedicated to the saints of the church. Hurdle said Nov. 1 is a day to celebrate children. As the students entered Hurdle’s classroom Monday morning for the celebration, they were excited and enthusiastic. Joler, who plans to be a veterinarian, said students have been learning how to add and subtract in Spanish, and she thinks knowing Spanish will help her in her profession. Cameron Goodwin, also 13, said typically the Day of the Dead is celebrated in graveyards and sometimes in people’s homes. Cameron Brockway, 13, agreed. He said eighth-graders can choose whether to take Spanish or French. Seventh graders are required to take Spanish and sixth graders must take French. He said he knew his friend, Goodwin, was taking Spanish again this year, so he decided to do it, too. “Mrs. Hurdle is a good teacher,” he said.